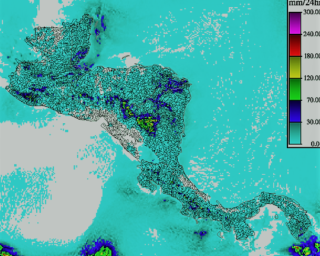 As part of the upgrade of the Central America Flash Flood Guidance (CAFFG) system, the WRF-ARW mesoscale model was configured and implemented for a domain that includes the entire Central America region. The application of the model to Central America was made by configuring a system of grids nested over the region. The WRF implementation used NCEP’s Global Forecast System (GFS) for definition of its initial and boundary conditions, and it involves assimilation of GPSRO data and a hot-start configuration. Specifically, the WRF model quantitative precipitation forecasts are ingested into the updated CAFFG system to provide forecast flash flood threat products.